Guidelines for Section 4(1)(b)(iv) - "the norms set by it for the discharge of its functions"
Guidelines for Section 4(1)(b)(xi)- "the budget allocated to each of its agency, indicating the particulars of all plans, proposed expenditures and reports on disbursements made". Proactive disclosure should be done in the local language so that it remains accessible to public. It should be presented in a form that is easily understood and if technical words are used they should be carefully explained. As provided in section 4, disclosure should be made in as many mediums as feasible and disclosures should be kept up to date. The disclosure of Information may be made keeping in mind the provisions of Section 8 to 11 of the RTI Act. Information relating to procurement made by Public Authorities including publication of notice/tender enquiries, corrigenda thereon, and details of bid awards detailing the name of the supplier of goods/services being procured or the works contracts entered or any such combination of these and the rate and total amount at which such procurement or works contract is to be done should be disclosed. All information disclosable as per Ministry of Finance, Department of Expenditure's O.M. No 10/1/2011-PPC dated 30th November, 2011 on Mandatory Publication of Tender Enquiries on the Central Public Procurement Portal and O.M. No. 10/3/2012- PPC dated 30th March, 2012 on Implementation of comprehensive end-to-end e-procurement should be disclosed under Section 4. At present the limit is fixed at Rs. 10.00 lakhs. In case of procurements made through DGS&D Rate Contracts or through Kendriya Bhandar/ NCCF, only award details need to be published. However information about procurement which fall within the purview of Section 8 of the RTI Act would be exempt. If Public services are proposed to be provided through a Public Private Partnership (PPP), all information relating to the PPPs must be disclosed in the public domain by the Public Authority entering into the PPP contract/concession agreement. This may include details of the Special Purpose Vehicle (SPV), if any set up, detailed project reports, concession agreements, operation and maintenance manuals and other documents generated as part of the implementation of the PPP project. The documents under the ambit of the exemption from disclosure of information under section 8(1)(d) and 8(1)(j) of the RTI Act would not be disclosed suo motu. Further, information about fees, tolls, or other kinds of revenue that may be collected under authorization from the Government, information in respect of outputs and outcomes, process of selection of the private sector party may also be proactively disclosed. All payments made under the PPP project may also be disclosed in a periodic manner along with the purpose of making such payment. Transfer policy for different grades/cadres of employees serving in Public Authority should be proactively disclosed. All transfer orders should be publicized through the website or in any other manner listed in Section 4(4) of the Act. These guidelines would not be applicable in cases of transfers made keeping in view sovereignty, integrity, security, strategic, scientific or economic interests of the State and the exemptions covered under Section 8 of the Act. These instructions would not apply to security and intelligence organizations under the second schedule of the RTI Act. All Public Authorities shall proactively disclose RTI applications and appeals received and their responses, on the websites maintained by Public Authorities with search facility based on key words. RTI applications and appeals received and their responses relating to the personal information of an individual may not be disclosed, as they do not serve any public interest. Public Authorities may proactively disclose the CAG & PAC paras and the Action Taken Reports (ATRs) only after these have been laid on the table of both the houses of the Parliament. However, CAG paras dealing with information about the issues of sovereignty, integrity, security, strategic, scientific or economic interests of the State and information covered under Section 8 of the RTI Act would be exempt. Citizens Charter prepared by the Ministry/Department, as part of the Result Framework Document of the department/organization should be proactively disclosed and six monthly report on the performance against the benchmarks set in Citizens Charter should also be displayed on the website of public authorities. All discretionary /non-discretionary grants/ allocations to state governments/ NGOs/Other institutions by Ministry/Department should be placed on the website of the Ministry/Department concerned. Annual Accounts of all legal entities who are provided grants by Public Authorities should be made available through publication, directly or indirectly on the Public Authority's website. Disclosures would be subject to provisions of Section 8 to 11 of the RTI Act. 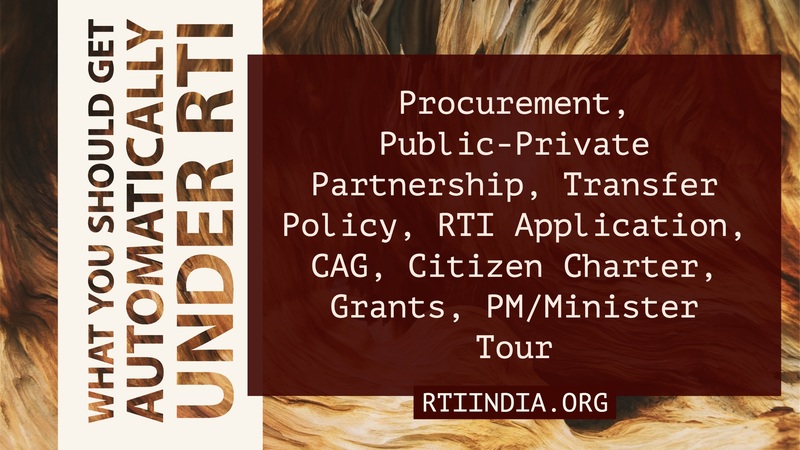 A large number of RTI queries are being filed on official tours undertaken by Ministers or officials of various Government Ministries/Departments. Information regarding the nature, place and period of foreign and domestic tours of Prime Minister are already disclosed on the PMO's website. As per DoPT's OM No. 1/8/2012-IR dated 11/9/2012, Public Authorities may proactively disclose the details of foreign and domestic official tours undertaken by the Minister(s) and officials of the rank of Joint Secretary to the Government of India and above and Heads of Departments, since 1st January, 2012. The disclosures may be updated once every quarter. Section 4 lays down that information should be provided through many mediums depending upon the level of the public authority and the recipient of information (for example, in case of Panchayat, wall painting may be more effective means of dissemination of information), and that more and more proactive disclosure would gradually be made through Internet. There is need for more clear guidelines for web-based publication of information for disclosure. While adhering to the standards of government guidelines as laid down by Department of Information Technology and Department of Administrative Reforms & Public Grievances, the following principles additionally should also be kept in view to ensure that websites' disclosures are complete, easily accessible, technology and platform neutral and in a form which conveys the desired information in an effective and user-friendly manner. It should be the endeavor of all public authorities that all entitlements to citizens and all transactions between the citizen and government are gradually made available through computer based interface. The 'Electronic Delivery of Services Bill, 2012' under formulation in Government of India would provide the necessary impetus. Websites should contain detailed information from the point of origin to the point of delivery of entitlements/services provided by the Public Authorities to citizens. Orders of the public authority should be uploaded on the website immediately after they have been issued. Website should contain all the relevant Acts, Rules, forms and other documents which are normally accessed by citizens. Websites should have detailed directory of key contacts, details of officials of the Public Authority. It is obligatory under Section 4(1)(b)(xiv) of the RTI Act for every Public Authority to proactively disclose 'details in respect of the information, available to or held by it, reduced in an electronic form'. The website should therefore indicate which digitally held information is made available publicly over the internet and which is not. As departments reorganize their systems and processes to enable themselves for electronic service delivery, it is recommended that the requirement of bringing due transparency as provided in the RTI Act is given adequate consideration at the design stage itself. To maintain reliability of information and its real time updation, information generation in a digital form should be automatically updated on the basis of key work outputs, like a muster roll and salary slip (NREGA in Andhra Pradesh) or formalization of a government order (Andhra Pradesh). Such an approach will lead to automation of proactive disclosure. Information must be presented from a user's perspective, which may require re- arranging it, simplifying it etc. However, original documents in original formats should continue to be made available because these are needed for community monitoring of government's functioning. The 'National Data Sharing and Accessibility Policy' by the Department of Science and Technology is based on the principle that all publicly funded information should be readily available. The policy has been notified in March, 2012 and the schedule should be strictly adhered to. Information and data should be presented in open data formats whereby it can be pulled by different Application Protocol Interfaces to be used in different fashions more appropriate to specific contexts and needs. Information/ data can, for instance, be presented in powerful visual ways using visualisation techniques. Such visual representation of information/ data can give insights that may remain largely hidden in a textual or tabular presentation of data. In some contexts, pictures and audio/videos recordings etc may be more useful. There have been moves in some parts of the country to video record Gram Sabha meetings. A picture of a NREGA worksite, for instance, may tell much more than words can. All such different media and forms should be used for proactive disclosure. Every webpage displaying information or data proactively disclosed under the RTI Act should, on the top right corner, display the mandatory field 'Date last updated (DD/MM/YY)'. Every public authority should specifically identify the major outputs/ tangible results/ services/ goods, as applicable, that it is responsible for providing to the public or to whosoever is the client of the public authority. In respect of (a) above, the decision-making chain should be identified in the form of a flow chart explaining the rank/grade of the public functionaries involved in the decision-making process and the specific stages in the decision-making hierarchy. The powers of each officer including powers of supervision over subordinates involved in the chain of decision-making must also be spelt out next to the flow chart or in a simple bullet-pointed format in a text-box. The exceptional circumstances when such standard decision-making processes may be overridden and by whom, should also be explained clearly. Where decentralization of decision-making has occurred in order to grant greater autonomy to public authorities, such procedures must also be clearly explained. This design of presentation should then be extended to cover all statutory and discretionary operations that are part of the public authority's mandate under the AOB read with the TOB. In the event of a public authority altering an existing decision-making process or adopting an entirely new process, such changes must be explained in simple language in order to enable people to easily understand the changes made. Defining the services and goods that the particular public authority/office provides directly (or indirectly through any other agency/contractor). Detailing and describing the processes by which the public can access and/or receive the goods and services that they are entitled to, from the public authority/office along with the forms, if any prescribed, for use by both the applicant and the service providing agency. Links to such forms (online), wherever available, should be given. Describing the conditions, criteria and priorities under which a person becomes eligible for the goods and services, and consequently the categories of people who are entitled to receive the goods and services. efining the quantitative and tangible parameters, (weight, size, frequency etc,) and timelines, that are applicable to the goods and services that are accessible to the public. Defining the qualitative and quantitative outcomes that each public authority/office plans to achieve through the goods and services that it was obligated to provide. Laying down individual responsibility for providing the goods and services (who is responsible for delivery/implementation and who is responsible for supervision). Keeping in view of the technical nature of the government budgets, it is essential that Ministries/Departments prepare simplified versions of their budgets which can be understood easily by general public and place them in public domain. Budgets and their periodic monitoring reports may also be presented in a more user-friendly manner through graphs and tables, etc. Outcome budget being prepared by Ministries/Departments of Government of India should be prominently displayed and be used as a basis to identify physical targets planned during the budgetary period and the actual achievement vis-à-vis those targets. A monthly programme implementation calendar method of reporting being followed in Karnataka is a useful model. Funds released to various autonomous organizations/ statutory organizations/ attached offices/ Public Sector Enterprises/ Societies/ NGOs/ Corporations etc. should be put on the website on a quarterly basis and budgets of such authorities may be made accessible through links from the website of the Ministry/Department. If a subsidiary does not have a website then the budgets and expenditure reports of such subsidiary authority may be uploaded on the website of the principal Public Authority. Wherever required by law or executive instruction, sector specific allocations and achievements of every department or public authority (where feasible) must be highlighted. For example, budget allocation and target focusing on gender, children, Scheduled Castes and Scheduled Tribes and religious minorities should be specially highlighted. The sector-wise breakup of these targets and actual outcomes must be given in simplified form to enable the vulnerable segments of society to better understand the budgets of public authorities. On the one hand, this clause serves as a means of proactively disclosing the progress made in computerizing information under Section 4(1)(a) of the RTI Act in a periodic manner. On the other, it provides people with clarity about the kinds of electronic information that, although not held by the public authority, is available to them. For example the stocks of ration available with individual fair price shops may not be held by the District Civil Supplies office, but may be available at a subordinate formation. Keeping in view the varied levels of computerization of records and documents in public authorities, data about records that have been digitized may be proactively disclosed on the respective websites, excluding those records /files /information that are exempted under Section 8. The data about digitized record may include the name of the record and any categorization or indexing used; the subject matter and any other information that is required to be compiled in relation to a file as prescribed by Manual of Office Procedure (and to be prescribed by MOP for electronic records that is under finalization by DARPG), the division/ section/ unit/ office where the record is normally held; the person, with designation, responsible for maintaining the record; and the life span of the record, as prescribed in the relevant record retention schedule. Each Ministry/Public Authority shall ensure that these guidelines are fully operationalized within a period of 6 months from the date of their issue. Proactive disclosure as per these guidelines would require collating a large quantum of information and digitizing it. For this purpose, Ministries/Public Authorities may engage consultants or outsource such work to expeditiously comply with these guidelines. For this purpose, the plan/non-plan funds of that department may be utilized. The Action Taken Report on the compliance of these guidelines should be sent, along with the URL link, to the DoPT and Central Information Commission soon after the expiry of the initial period of 6 months. Each Ministry/ Public Authority should get its proactive disclosure package audited by third party every year. The audit should cover compliance with the proactive disclosure guidelines as well as adequacy of the items included in the package. The audit should examine whether there are any other types of information which could be proactively disclosed. Such audit should be done annually and should be communicated to the Central Information Commission annually through publication on their own websites. All Public Authorities should proactively disclose the names of the third party auditors on their website. For carrying out third party audit through outside consultants also, Ministries/Public Authorities should utilize their plan/non-plan funds. The Central Information Commission should examine the third-party audit reports for each Ministry/Public Authority and offer advice/recommendations to the concerned Ministries/ Public Authorities. Central Information Commission should carry out sample audit of few of the Ministries/ Public Authorities each year with regard to adequacy of items included as well as compliance of the Ministry/Public Authority with these guidelines. Compliance with the proactive disclosure guidelines, its audit by third party and its communication to the Central Information Commission should be included as RFD target. The Guidelines of Suo-Moto Disclosure is enclosed1) The work copy of the Suo Moto Disclosure can be downloaded from this link. Created by shrawan on 2018/02/05 04:16.